The latest collection from designer Aline Moreno titled “Rituales” was inspired in the Huichol culture and symbols of peyote, the “eye of God” and deer. It was an evening filled with glamour, style and celebrities ranged around a catwalk with the spotlight on fashion: welcome to the 14th annual Cocktail de la Moda, or Fashion Cocktail, held in Mexico City, where the Riviera Nayarit was present for the third time—and the only destination represented at the event. The Riviera Nayarit has inspired the fashion world and on this occasion, Jalisco-born designer Aline Moreno presented her collection titled “Rituales,” her interpretation of the Huichol culture that resulted in beautiful, unique designs that showcase the beauty of this ethnicity. “My new collection is based on nuances of the Huichol rituals, which lent their magic and fluidity to the clothing with the mystical creatures that represent a link with the sacred world. In this new collection, ‘Rituales,’ you’ll find many elements such as the peyote, the “eye of God” and the sacred deer, where once again I turn to the Riviera Nayarit for inspiration,” explained Mexican designer Aline Moreno. “Rituales” is a product of the success Moreno experienced with her first collection, “Wixárikas,” which is why the Jalisco-born designer decided to develop all the elements she discovered during her investigation of the Huichol culture. Thus was born a unique and very representative collection that will doubtless serve as an important connection for Mexico with the rest of the world. 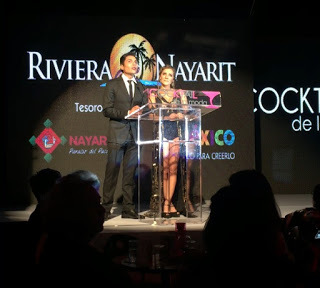 There were plenty of celebrities present at this event, which was dedicated to TV presenter and journalist Fernanda Tapia, including Susana Alexander, Jorge Ortiz de Pinedo, Yahir, Claudia Lizaldi, Plutarco Haza, Francisco Zea, Xochitl Galvéz, Gaby Carillo, Reynaldo Rossano “El Papirrin” and Claudia Cervantes, among others, who all clearly enjoyed the fashion shows during one of the top events of its kind in the country.